Black Sabbath, the band credited with inventing heavy metal music, have played their last concert. The two-hour gig at the NEC Arena in their home city of Birmingham saw the rock veterans play 15 songs ending with their first hit, Paranoid. Ticker tape and balloons fell as singer Ozzy Osbourne, 68, thanked fans for nearly five decades of support. Sabbath’s The End Tour began in the US in January last year and took in 81 dates across the world. The tour schedule saw the band visit Australasia, Europe, North America and South America, finishing with two shows in Birmingham. Black Sabbath Final Concert in Birmingham 4/2-2017. Last song was Paranoid. Black Sabbath were formed in 1968 by Osbourne, guitarist Tony Iommi, bassist Geezer Butler and drummer Bill Ward. While Osbourne quit in 1977 to be replaced by Rainbow’s Ronnie James Dio, the classic line-up made their way back in 1997. Ward has not played with the band since 2012 and Osbourne, Iommi and Butler were joined on stage at the final shows by drummer Tommy Clufetos and keyboard player Adam Wakeman. 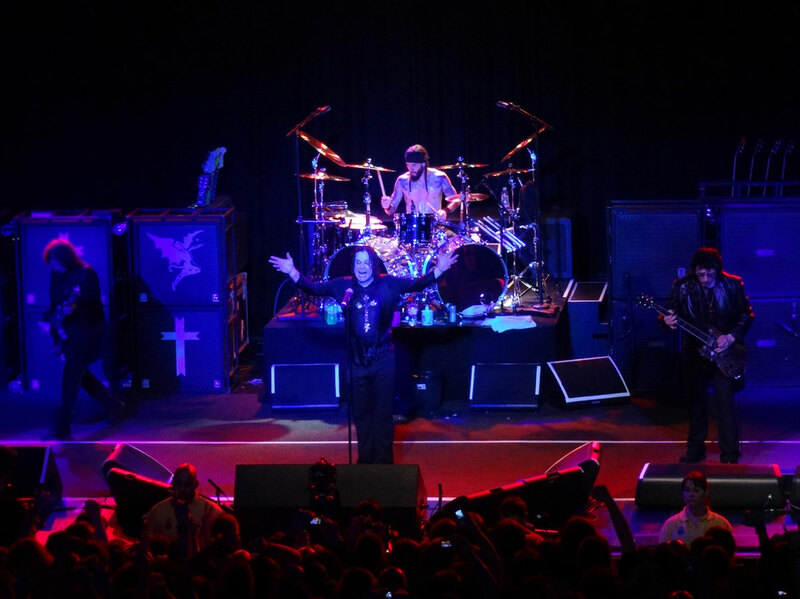 The final song was streamed live on Sabbath’s Facebook page and fireworks went off as the band took their final bow, posing for a farewell photograph in front of the cheering crowd. “Thank you, goodnight, thank you so much,” Osbourne said as they left the stage. Iommi gave a thumbs-up as he waved goodbye. Speaking to the BBC before the final show, Osbourne said he was “a whirlwind of emotions”. “I remember playing the Crown pub in Birmingham and thinking, ‘This’ll be good for a couple of years – drink a few beers and have a jam’. BBC music reporter Colin Paterson said the final concert was heavy on nostalgia, with only one of the songs played having been released after 1972. The fans were also having their portraits taken and memories recorded, as part of the Home of Metal project.